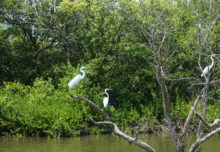 Restoration plays a key role in sustainable development. With countries making significant pledges under the Bonn Challenge to restore degraded land, achieving these objectives at scale requires integrated systems that provide diverse, adapted and high-quality native tree seeds and planting material. However, there remains a gap in capacity, as studies have documented that the quality and quantity of tree germplasm is not always adequately addressed in restoration projects. Research is now generating solutions to help the global community move from pledges to impact when it comes to tree seeds and seedlings. 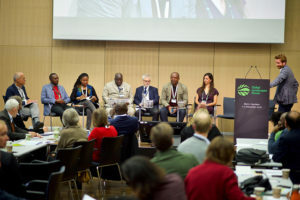 A discussion at the recent Global Landscapes Forum (GLF) in Bonn, Germany, hosted by the CGIAR Research Program on Forests, Trees and Agroforestry (FTA) with Bioversity International, the World Agroforestry Centre (ICRAF) and supported by the Food and Agriculture Organization of the United Nations (FAO) – Delivery of quality and diverse planting material is a major constraint for restoration – brought these issues to the fore. In opening the discussion, Bioversity International’s leader of forest genetic resources and restoration Christopher Kettle, whose work also forms part of FTA, introduced how researchers can help to generate the volume of seeds needed to achieve development objectives. In line with this, FTA Director Vincent Gitz highlighted that restoration is a priority for research programs such as FTA. In order to be successful, projects should integrate the availability of good tree planting materials from the outset to implementation, he suggested. Giving a keynote, senior advisor on tropical trees and landscapes at the University of Copenhagen Lars Graudal, who is also coleader of tree productivity and diversity at ICRAF, echoed Kettle in asking whether the reproductive material of trees constituted a barrier for landscape restoration. 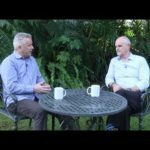 Referring to the Bonn Challenge – which aims to restore 150 million hectares of deforested and degraded land by 2020, and 350 million ha by 2030 – the largest restoration in history, which is backed by conventions and the sustainable development agenda, Graudal said it is one thing to have a plan, and another to implement it. Despite shortfalls in investments, there is reason for optimism as public support for the plan has never been greater, he said. There is a “positive correlation with biodiversity and resilience, agricultural produce and dietary diversity,” he explained. The world faces challenges of mobilizing diversity before it disappears; focusing on dealing with numerous species rather than only a few; linking that work with conservation, breeding and delivery programs; and achieving efficient programs by empowering users. The discussion continued with a panel of speakers considering situations on the ground where restoration efforts are being implemented. Featuring Cameroon-based forest engineer Anicet Ngomin; Burkina Faso’s National Tree Seed Center director general Moussa Ouedraogo; Charles Karangwa of the International Union for Conservation of Nature in Rwanda; biologist and youth representative Vania Olmos Lau; social entrepreneur Doreen Mashu; and FAO’s Forest and Landscape Restoration Mechanism coordinator Douglas McGuire, the panel looked at how the ability to deliver diverse and quality seed and planting material is impacting countries’ pledges. Outlining some of the regional challenges in meeting restoration commitments, Ouedraogo said Burkina Faso has committed to planting 5 million hectares by 2030, but has experienced a 30-35 percent survival rate of trees after one year of planting. Native species remain threatened, he added. 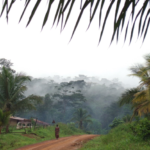 Ngomin said Cameroon has committed to restoring 12 million hectares of degraded landscapes by 2030, with seeds forming an important part of reforestation programs. Tree seed diversity determines the extent and speed to which ambitious restoration targets can be achieved, said Karangwa. While widespread eucalyptus monoculture in Rwanda affects land productivity, restoration would bring multiple benefits to both people and landscapes. Although farmers know the importance of trees on farms, he added, they “feel like trees are competing with crops, because of the quality and the type of trees we are telling them to plant.” This shows that tree seed diversity is paramount, he said. Lau emphasized that achieving the Bonn Challenge is also important to youth. She cited as examples a lack of knowledge and access to seeds in Paraguay, as well as bureaucratic hurdles in Mexico, as existing barriers to restoration. Mashu, who is the founder of The Good Heritage in Zimbabwe – a wellness brand using non-timber forest resources to create products – underlined the need for a clear connection between restoration efforts and economic activity. “Companies are thinking about doing good in additional to making financial returns,” she said. Thus, business can be a vehicle for restoration for both businesspeople and the scientists who support it, she explained. McGuire addressed time-bound political commitments, and how to balance these with the time needed to understand the science and practical issues behind tree planting. There are new projects indicating huge momentum both politically and financially, he explained, but many stakeholders have yet to address the technicalities of planting material. Building on Mashu’s comments, he also underlined the role of the private sector and embedding restoration into economic realities. 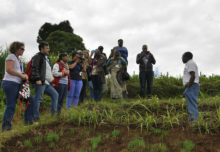 Following on with keynote speeches were scientist Marius Ekué, Bioversity International’s representative in Cameroon and a member of FTA, and ICRAF’s Ramni Jamnadass, who is the leader of FTA’s Flagship 1 on tree genetic resources. Ekué introduced the Trees for Seeds initiative, which was launched at GLF Nairobi in August and aims to safeguard diversity. “Trees don’t have borders, so we work within a network,” he said, referring to networks that exist across Africa, Asia and Latin America. In line with the initiative, researchers have developed decision support tools to help practitioners select the right tree species for the right places, such as RESTOOL. This can help to understand how seed systems work in different countries, including how they are harvested, produced and distributed. With this information, researchers can then assess how to deliver at scale using innovative technologies. 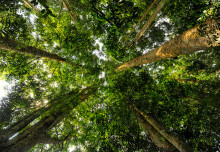 Similarly, Jamnadass covered the quality of restoration, and the right tree for the right place and the right purpose. She also highlighted other decision support tools such as Useful Tree Species for Africa and the Vegetation Map for Africa. Research needs to put food trees back into landscapes using the restoration agenda, she emphasized. The panel then continued with a second phase of discussion, articulating concrete solutions for lifting barriers to scale – raising the need to invest in knowledge and science, greater collaboration between partners, harnessing local knowledge, strengthening delivery systems as a local level, bridging gaps between science and policy, and capacity building. In closing, Erick Fernandes, an adviser on agriculture, forestry and climate change to the World Bank Group, reiterated that the desire to restore land is strong. As stated by the Trees for Seeds project, using the right mix of native trees in forest restoration efforts is essential to deliver on multiple SDGs, including reducing poverty and food insecurity, and supporting biodiversity. Planting a trillion trees, and ensuring that they are the right trees in the right place, offers a powerful development solution.